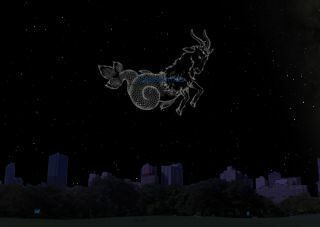 An artist's rendition of the constellation Capricornus, the Sea Goat, as it appears at 9pm local time to observers in mid-northern latitudes. An unusual star pattern denoting an exceedingly unusual beast will be visible in the night sky this week — the sea goat. Step outside this week between 9 and 11 p.m. and look toward the south and you might get the impression that the sky is rather devoid of stars. This is especially true if you live in an area that has lots of bright lights. Indeed, little can be seen when the sky is hazy or flooded with moonlight, but careful viewing is rewarded. Welcome to the "watery" region of the sky where all the star patterns are rather dim. Here, we find a number of constellations with a direct connection to water: A man carrying water and sloshing it all over the place, and below him are the Southern Fish and the Crane — a bird dependent on wetlands. Farther east are the large, dull figures of the Fishes themselves, a killer Whale and a celestial River. Probably because the ancients knew very little about marine life, it's not surprising that they populated the deep with every manner of monster, including what we now call mermaids. An excellent example of this — the watery star pattern that leads the procession of these constellations across the autumn skies — is Capricornus, the Sea Goat, one of those odd land-sea animal hybrids the ancients were wont to create. This image shows the star lines that make up Capricornus in the night sky as they relate to other constellations. In the old star atlases, Capricornus is depicted by the figure of a sea goat, combining the forequarters and head of a goat and the tail of a fish. This kind of creature might seem unintelligible to us today if we did not know the ancient myth behind its origin. According to folklore, there were some sea nymphs and goddesses having a wild party in a field one day when the mischievous Pan,god of shepherds and of woods and pastures, saw them and joined in the fun. Everything was going swimmingly, so to speak, when a huge, ferocious monster called Typhon suddenly appeared. To escape him, each god changed into an animal and fled. However, in Pan's alarm he jumped into a nearby river before completing his transformation into a goat. As a result, his lower extremities assumed the form of a fish. From this aspect of Pan's nature Greek authors derived the word panikon, "sudden fear," the ultimate source of the English word "panic." Zeus, who just happened to be passing by, saw Pan's feat and was so amused that he decreed the perpetuation of this rather grotesque figure in our night sky. Capricornus appears directly due south when Cygnus, the Swan — also known as the Northern Cross — is high overhead. The bright star Altair in Aquila, the Eagle and its two flanking stars point straight down toward Capricornus. The stars of the Sea Goat form a roughly triangular figure that somewhat suggests everything from an inverted cocked hat, a slice of watermelon, a bird or large bat flying toward you or perhaps even a boat. Everything, that is, but a goat with a fish tail! It should be emphasized to astronomy newcomers that the currently accepted name of this constellation is Capricornus, and not Capricorn. Astrologers (and some older astronomy books) use "Capricorn" to denote the zodiacal sign rather than the constellation. "Whoso is born in Capricorn shall be rich and well loved," said an old almanac. Then it went on to say that Capricorn was the House of the planet Saturn that often had an unfavorable influence on human affairs. Though born under Capricorn, one might therefore be poor after all. One of the oldest references to a particular constellation is supposedly from the records of Sargon, founder of the first Semitic empire of Babylon in about 2800 B.C. The records foretold the destruction of the world by fire if all the five naked-eye planets should ever meet together in the sign of Capricorn. Chinese astronomers in 2449 B.C. supposedly observed such a conjunction of all five planets in Capricorn, but it took place without any dire consequences. Then again, the truth is that this exceedingly rare "celestial summit meeting" never took place. Recently I used a computer program that depicts what the sky looked like for thousands of years in the past or future to check where the planets were in 2449 B.C. —no such planetary gathering occurred. So much for foretelling the destruction of the world. Quite frankly, if the Sea Goat were not in the zodiac most people probably would not even know its name. Oh, well, whatever floats your goat.